When life gives you limited parking, make sure you have your step stool and toolbox handy. 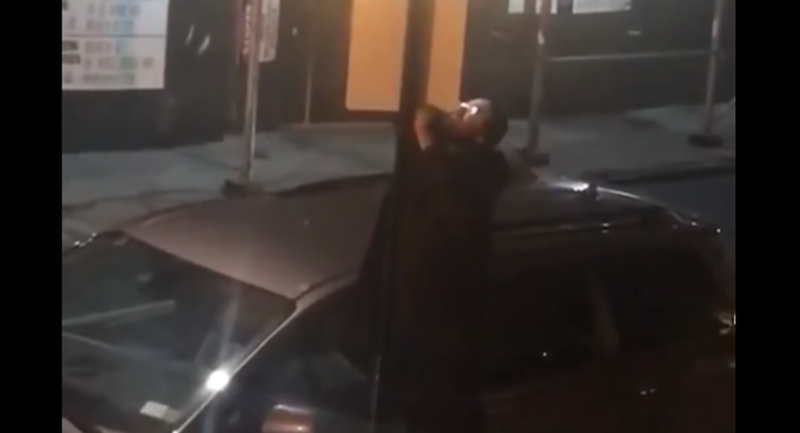 It's well known that parking can be a headache in New York City, but footage uploaded to Rumble Viral Thursday shows that rather than getting mad (or towed), some choose to simply change the rules of the street. Hearing uncommon commotion outside his window, a Brooklyn resident opened his blinds to find a man standing on a household stepladder and removing a "No Parking" sign from its post. While the video footage does not show the man parking the minivan, it's safe to assume the individual, sporting a kippah, was removing the sign to avoid being slapped with a parking fee. While the man may get away with the deed overnight and prevent a potential towing, the act of removing and subsequently stealing the sign could get the motorist a misdemeanor theft charge — as well a fine much higher than most parking violations would bring.